A simply lovely local museum with lots of interesting items. Will come again. Thank you so much for all of your help and support over the past academic year. It is much appreciated. Very impressive museum with great local displays to give a visitor insights into Rayleigh. Many thanks to Trevor & all the volunteers for putting the Speedway talk on again. My Dad (Stan Simpkins) & I thoroughly enjoyed it. I wanted to take him but didn't think it would really be my thing, however I found it really interesting & entertaining and Dad was in his element, thank you so much for making us welcome. 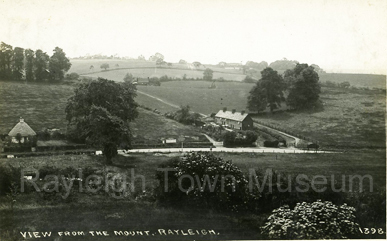 And for all you do to preserve & research the history of Rayleigh! Suffragettes, Excellent, informative and interesting. Thank you for a lovely afternoon. You and Viv looked after us so well. All our members thoroughly enjoyed the visit and no doubt you will see more of them over the course of time. This is a real labour of love for those involved and their efforts really are worthwhile. There is a substantial collection of pictures and paper cuttings along with some other items of interest, such as some of the original stain glass windows from the since demolished speedway/greyhound stadium. Many of the pictures are fascinating for comparisons as how the area looks today, especially those of the high street. The stories behind some of the local people and businesses are also great reading and for anyone with an interest in the town and its locality I cannot recommend it highly enough. It is all capped off by very friendly staff who are willing to talk about the museum. Thank you very much indeed for the wonderful talk you gave to the FOSMS (Friends of Southend Museums) group on Thursday. On the way out so many people were telling me how much they had enjoyed it - all were smiling and one gentleman said it was 'inspiring', they all agreed! I'm sure many will visit the Museum, I certainly will. Very interesting & looking forward to finding out if any of my ancestors were suffragettes! Very important and an absolute treasure to the town, thank you!! Many thanks for your informative and entertaining walk and talk this morning, it was very much enjoyed by us all. Can we also congratulate you on your excellent, interesting and welcoming Museum, such a delightful place. Thank you also for providing us with the Heritage Trail leaflets, I know that many of our group commented that they will be returning soon with friends and family to cover the route again. I went to the museum during a visit to Rayleigh, entry is free and it is open on Wednesday, Friday, Saturday and Sunday from 10 AM until 4 PM. 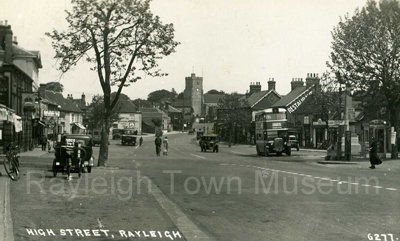 There is much of historical interest about Rayleigh including photographs and objects including camera's and a cinema projector. There are also archives to study. Well worth a visit, highly recommended. "I love visiting the museum. It's fascinating to see and hear so many relics and stories from Rayleigh's past. What's really good is that you are welcome to sit and pore over a wealth of old photos and postcards and go through archives of documents and booklets. Every Rayleigh resident should check it out to get a totally new perspective of our town!" "A lovely little museum stacked with local history"
Hi, greetings all the way from Lower Hutt New Zealand. Just to let you guys know I received a copy of your 2018 Heritage Calendar today posted to me by my sister in Rayleigh. Kind regards and keep up the good work guys, have a great festive season. Thank you so much for the thought provoking assemblies recently on Remembrance. The pupils enjoyed hearing about local stories and the impact of war on Rayleigh itself. We look forward to working with you again in the future. 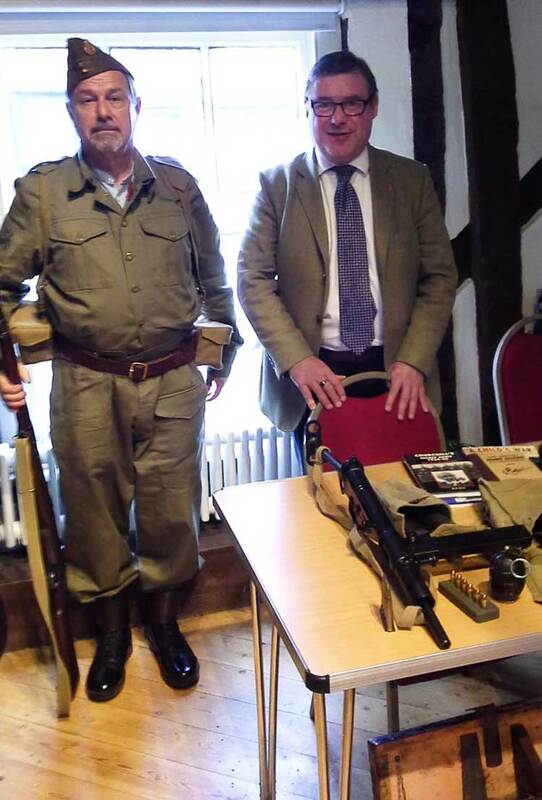 Rayleigh and Wickford MP and Patron of the Rayleigh Town Museum, Mark Francois, dropped by the museum recently in order to see our special exhibition on life on the Home Front in Rayleigh during World War Two. Mark viewed a number of exhibits including photographs of Rayleigh taken during the war, documents advising the Rayleigh Urban District Council on what to do in the event of a German invasion and a number of other artefacts including some weapons from the time. Mark also saw documents in relation to the rationing that people had to undergo during war time. The exhibition was brought to life by Trevor, a volunteer from the Hertfordshire Home Guard Historical Re-enactment Society, who was present in his Home Guard uniform with a variety of de-activated weapons and was able to answer questions from visitors about what it was like to serve in the Home Guard during World War Two. The exhibition, which ran for several weeks, was very popular and received hundreds of visitors, including parties of local school children keen to learn about the history of the war in their community. The Chairman of Essex County Council, Cllr John Aldridge visited the museum with his wife Christine. Cllr Aldridge wrote "A remarkable enterprise that reflects the energy of the curators and the community spirit of the town of Rayleigh." in our visitors book. 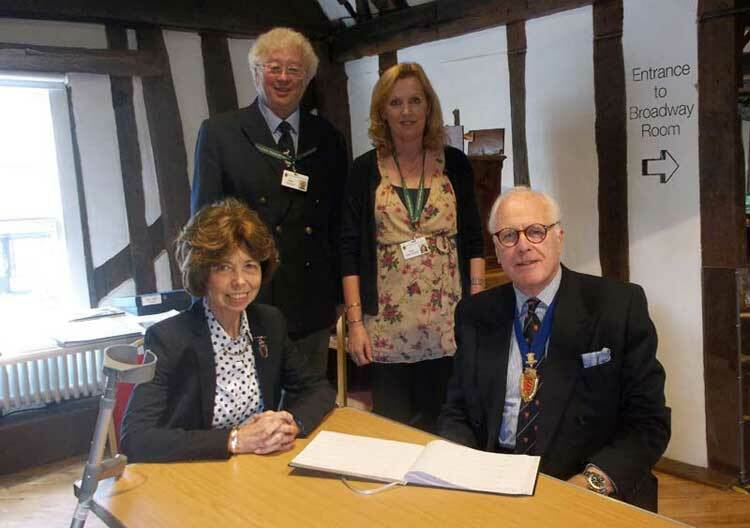 Behind Cllr Aldridge and his wife are Chairman of the Museum, Mike Davies and Sue Smith. Please check back here regularly for updates on our progress and information on fundraising events.